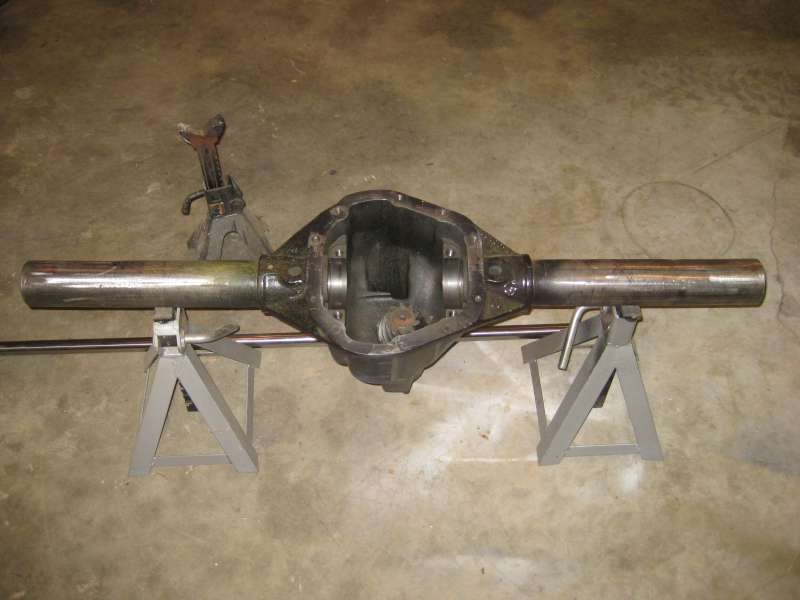 The basics of narrowing a rear axle are very similar to narrowing a front axle, except you have nothing to line the axle back up with and you do not have a few degrees of forgiveness that you get with front u-joints. The key to narrowing a rear axle is the use of an alignment bar to get everything straight and hold everything straight while you start welding it together. The cutting, grinding, and prep of the axle housing are the same front or rear. Measure 3x and cut once! On a rear axle you need to calculate how much tube you need to remove and find a spot far enough away from the housing end to make your cut, so as not to cut through the axle seal seat. Or you can buy all new axle housing ends and make your cut based on the new ends. Each rear end is different and they all need to be measured in there own way. 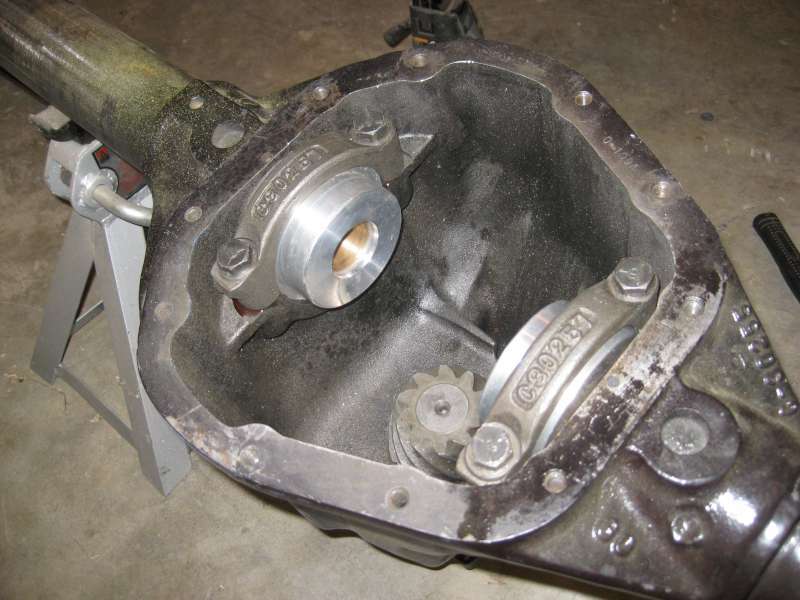 A Ford 9" has an offset differential centerline requiring two different axle shaft lengths to get a truly centered rear axle, a Dana 44 has equal axle shaft lengths. 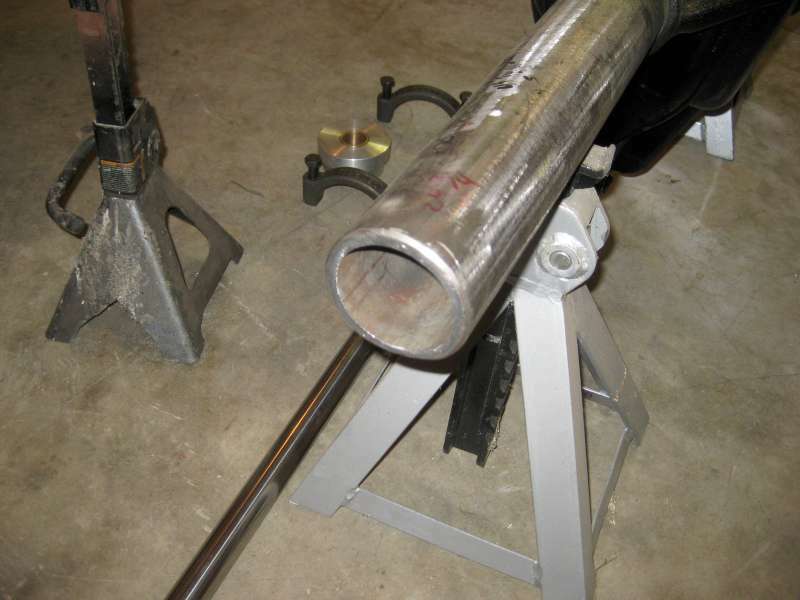 So before you start a rear axle narrowing project, do your homework and make a plan and make a bunch of measurements. I will assume you have made your measurements and have your plan and jump right to the narrowing portion. 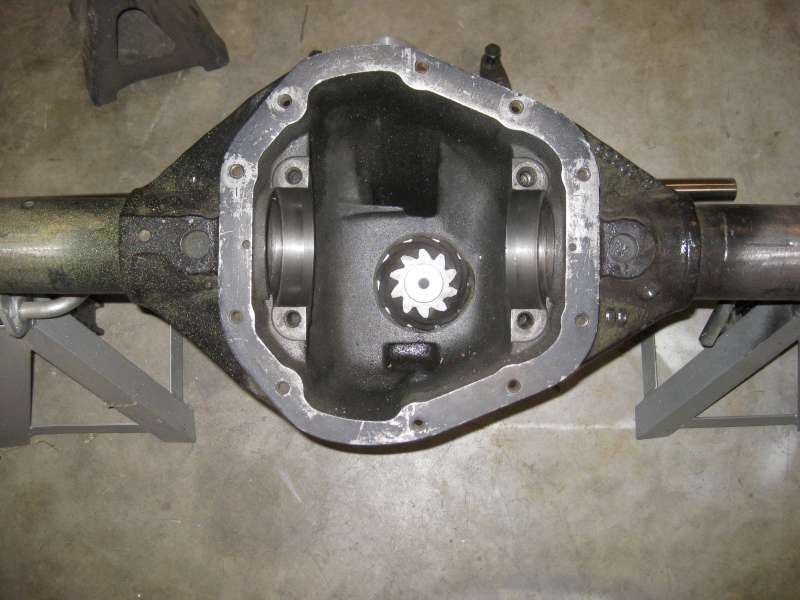 The ends of this Dana 60 rear axle have been cut off, the housing has been cleaned and ground smooth. This is where the alignment bar is used. The bar is a special straight and true piece of round steel bar that has been ground and polished to a exact diameter. I use a 6 foot long 1.25" diameter bar for my setup. Sets of pucks are used with the alignment bar. The pucks are machined to take the place of the carrier bearings in the differential and the axle bearings at the axle ends. 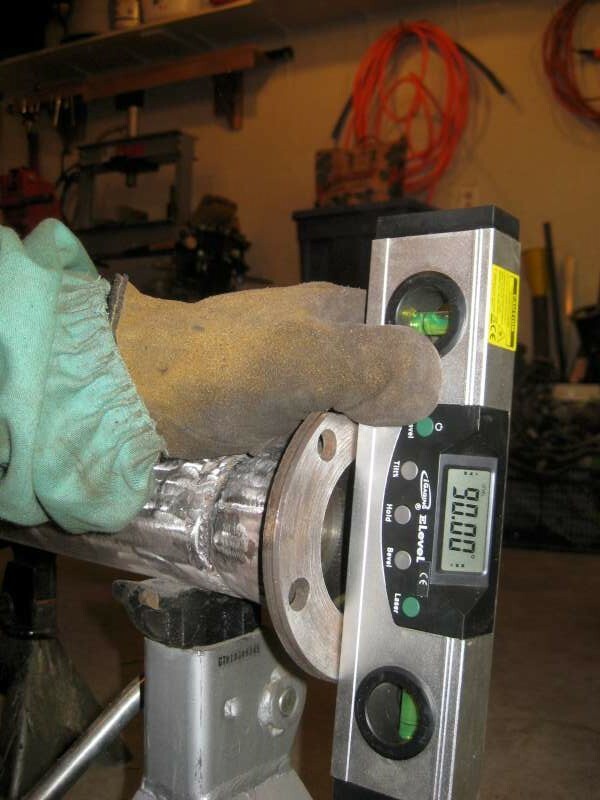 The pucks are matched to the diameter of your alignment bar and come mostly come in 1.25" and 1.5" sizes. 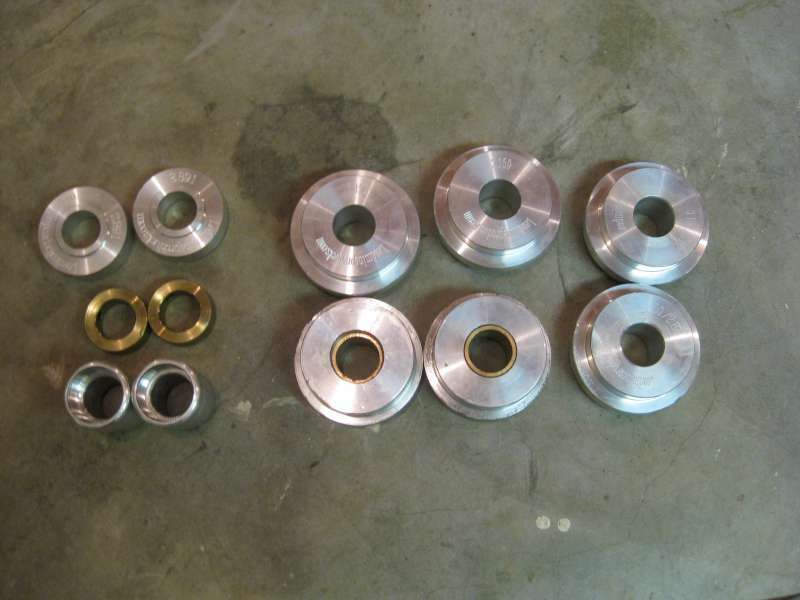 Above in a fairly complete set of pucks for a variety of rear axles and Dana 44 front spindles as well. With the pucks on the alignment bar you can locate the true axle center line of the axle shafts and keep things in line while you tack weld everything together. With a rear axle a little error in your alignment will show up in quickly worn bearings, leaking seals and at worse a broken axle shaft. You can see the carrier bearing puck installed in the housing. I torque the pucks down to spec to help get everything aligned as closely as possible. 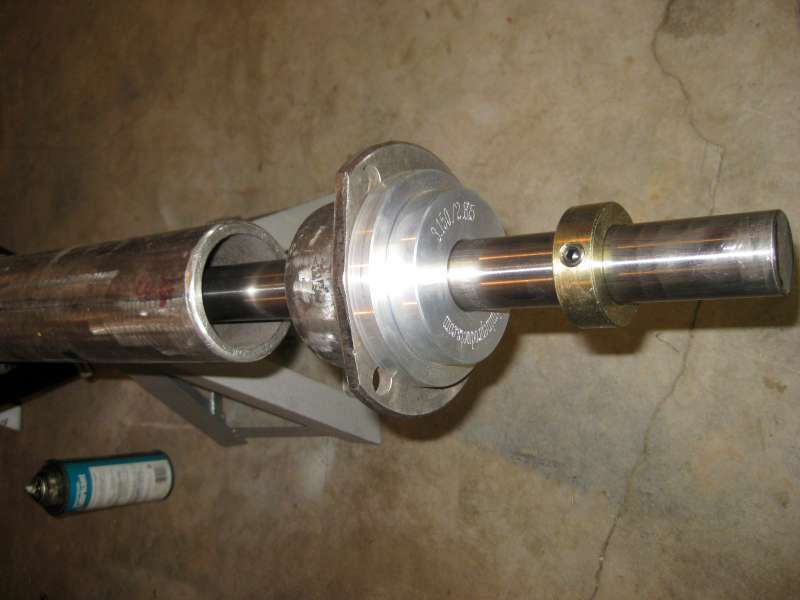 The alignment bar is then installed through the carrier bearing pucks and the ends are installed on the bar. In this example I am using semi float SET-10 size ends. The end puck is placed in the end and slide on the bar and retained with a keeper that is held tight with a set screw. With everything in place the bar should still rotate freely. If it does not rotate, something is miss aligned. 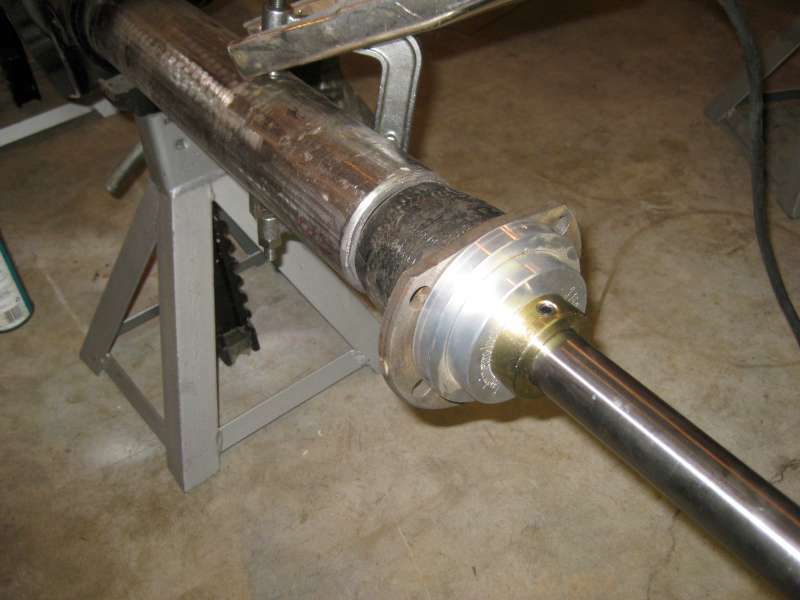 The new end and the axle tube have been beveled a small amount to allow a solid penetrating weld. I then make small tack welds around the tube on opposite sides, almost like you are torque a wheel. After 4 solid tacks, I switch to the other end and tack weld it in place. 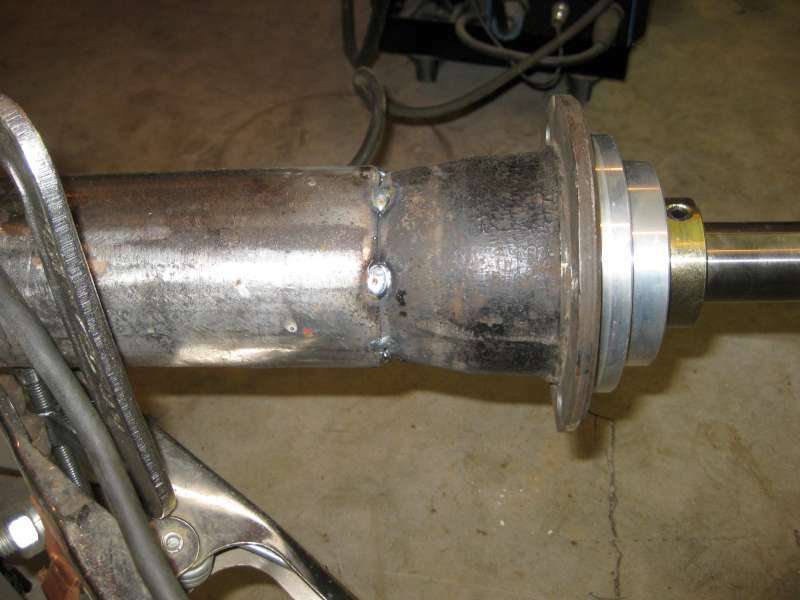 The key is to not overheat the axle tube or end and introduce heat warpage. The alignment bar is not strong enough to hold everything in place if you overheat one area. 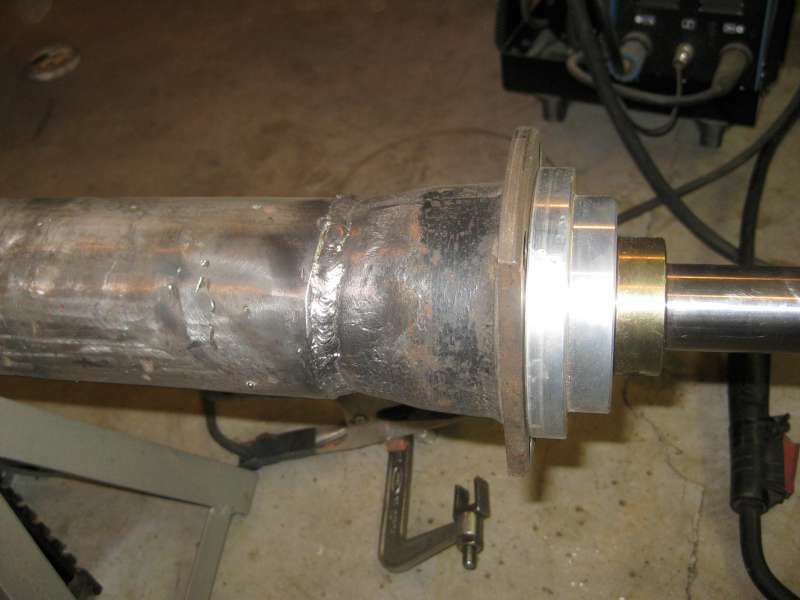 IN this example the tubes are 1/4" thick, which make welding easier. On a Ford 9" housing the tubes are much thinner and will move and warp as you go. After everything has been tacked I make sure the bar is still free and not bound up. If you check the ends after you are done they should be aligned with the carrier center line and square to the center line, giving you a true and straight axle. 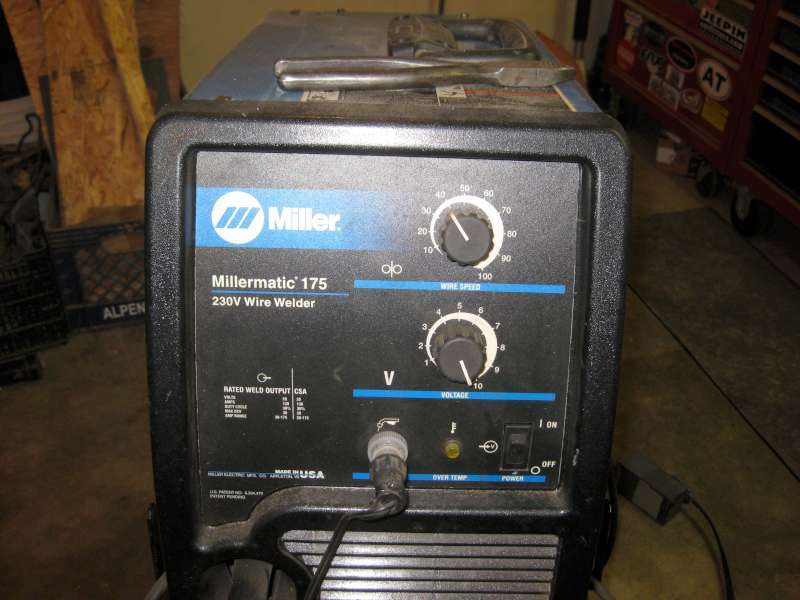 I do all of my welding with a Millermatic 175 Mig welder. It has enough power to weld 1/4" with a single pass and enough adjustment to weld 1/8" thick material with lots of control. 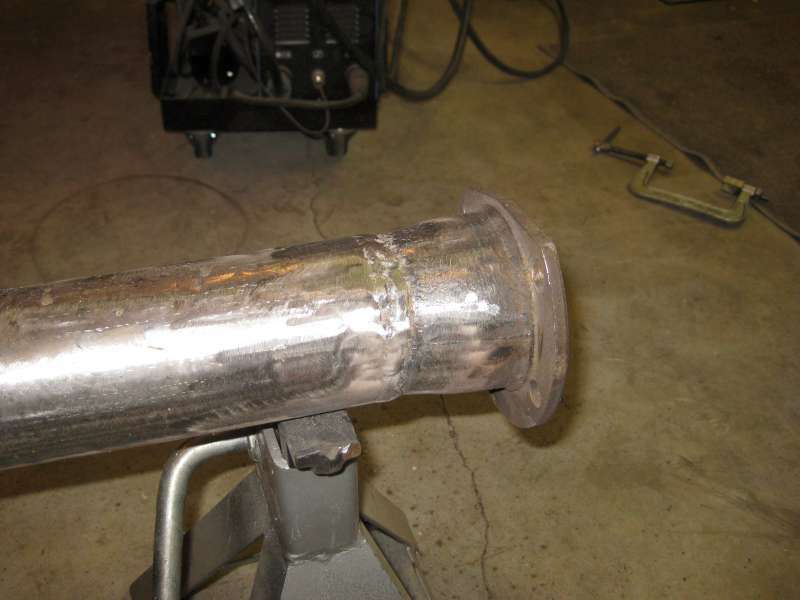 If you are not a confident welder and do not have experience welding axle housings, please do not make a job like this your first attempt. Find a friend who can weld and learn from them.